When is a session considered an Inactive Session? When does the ASA drop the SSL-Tunnel? Why do Keepalives need to be enabled if DPDs are already enabled? Q1. Anyconnect DPD has an interval but no retries - how many packets does it have to miss before it marks the remote end as dead? Q2. Is the DPD processing different for AnyConnect with IKEv2? Q3. Is there another purpose for the AnyConnect Parent-Tunnel? Q4. Can you filter and log off just inactive sessions? Q5. What happens to the Parent-Tunnel when the DTLS or TLS tunnels Idle-Timeout expires? Q6. What is the point of keeping the session once the DPD timers have disconnected the session and why does the ASA not release the IP address? Q7. What is the behavior if the ASA fails over from Active to Standby? Q8. Why are there two different timeouts, the idle timeout and the disconnected timeout, if they are both the same value? Q9. What happens when the client machine is suspended? Q10. When a reconnect happens, does the AnyConnect Virtual Adapter flap or does the routing table change at all? Q11. Does the ?Auto Reconnect? provide Session Persistence? If so, is there any extra functionality added in the AnyConnect Client? Q12. This feature works on all variants of Microsoft Windows (Vista 32-bit & 64-bit, XP). How about the Macintosh? Does it work on OS X 10.4? Q13. Are there any limitations to the feature in terms of connectivity (Wired, wi-fi, 3G and so on)? Does it support transition from one mode to another (from Wi-Fi to 3G, 3G to wired, and so on)? Q14. How is the resume operation authenticated? Q15. Is LDAP authorization also performed upon reconnect or only the authentication? Q16. Does pre-login and/or hostscan run upon resume? Q17. With respect to VPN Load Balancing (LB) and connection resume, will the client connect back directly to the cluster member it was connected to before? This document describes in detail some important points about the Cisco AnyConnect Secure Mobility Client (AnyConnect) tunnels, the reconnect behavior and Dead Peer Detection (DPD), and the inactivity timer. Clientless or Parent-Tunnel: This is the main session that is created in the negotiation in order to set up the session token that is necessary in case a reconnect is needed due to network connectivity issues or hibernation. Based on the connection mechanism, the Cisco Adaptive Security Appliance (ASA) lists the session as Clientless (Weblaunch via the Portal) or Parent (Standalone AnyConnect). Note: The AnyConnect-Parent represents the session when the client is not actively connected. Effectively, it works similar to a cookie, in that it is a database entry on the ASA that maps to the connection from a particular client. If the client shuts down or sleeps, the tunnels (IPsec/Internet Key Exchange (IKE)/ Transport Layer Security (TLS)/Datagram Transport Layer Security (DTLS) protocols) are torn down, but the Parent remains until the idle timer or maximum connect time takes effect. This allows the user to reconnect without reauthenticating. Secure Sockets Layer (SSL)-Tunnel: The SSL connection is established first, and data is passed over this connection while it attempts to establish a DTLS connection. Once the DTLS connection is established, the client sends the packets via the DTLS connection instead of via the SSL connection. Control packets, on the other hand, always go over the SSL connection. DTLS-Tunnel: When the DTLS-Tunnel is fully established, all data moves to the DTLS-tunnel, and the SSL-Tunnel is only used for occasional control channel traffic. If something happens to User Datagram Protocol (UDP), the DTLS-Tunnel is torn down and all data passes through the SSL-Tunnel again. Here is sample output from the two connection methods. The session is considered Inactive (and the timer begins to increase) only when the SSL-Tunnel does not exist anymore in the session. So, each session is time-stamped with the SSL-Tunnel drop time. In order to configure DPDs, use the anyconnect dpd-interval command under the WebVPN attributes in the group-policy settings. By default, the DPD is enabled and set to 30 seconds for both the ASA (gateway) and the client. Caution: Be aware of Cisco bug ID CSCts66926 - DPD fails to terminate DTLS tunnel after lost client connection. Idle-Timeout - The second way that the SSL-Tunnel is disconnected is when the Idle-Timeout for this tunnel expires. However, remember that it is not only the SSL-Tunnel that must idle out, but the DTLS tunnel as well. Unless the DTLS session times out, the SSL-Tunnel is retained in the database. As explained previously, the DPD does not kill the AnyConnect session itself. It merely kills the tunnel within that session so that the client can reestablish the tunnel. If the client cannot reestablish the tunnel, the session remains until the idle timer expires on the ASA. Since DPDs are enabled by default, customers might often get disconnected due to flows closing in one direction with Network Address Translation (NAT), Firewall and Proxy devices. Enabling keepalives at low intervals, such as 20 seconds, helps to prevent this. Keepalives are enabled under the WebVPN attributes of a particular group-policy with the anyconnect ssl keepalive command. By default, the timers are set to 20 seconds. AnyConnect will attempt to reconnect if the connection is disrupted. This is not configurable, automatically. As long as the VPN session on the ASA is still valid and if AnyConnect can re-establish the physical connection, the VPN session will be resumed. The reconnect feature continues until the session timeout or the disconnect timeout, which is actually the idle timeout, expires (or 30 minutes if no timeouts are configured). Once these expire, you should not continue because the ASA will have dropped the VPN session. The client will continue as long as it thinks the ASA still has the VPN session. AnyConnect will reconnect no matter how the network interface changes. It does not matter if the IP address of the Network Interface Card (NIC) changes, or if connectivity switches from one NIC to another NIC (wireless to wired or vice versa). TLS, DTLS, or IPSec(IKE+ESP) [OSI Layer 4] - TLS resumption is not supported. VPN [OSI layer 7] - The VPN session token is used as an authentication token in order to reestablish the VPN session over a secured channel when there is a disruption. It is a proprietary mechanism that is very similar, conceptually, to how a Kerberos token or a client certificate is used for authentication. The token is unique and cryptographically generated by the head-end, which contains the session ID plus a cryptographically generated random payload. It is passed to the client as part of the initial VPN establishment after a secure channel to the head-end is established. It remains valid for the lifetime of the session on the head-end, and it is stored in the client memory, which is a privileged process. A Disconnect Timeout timer is started as soon as the network connection is disrupted. The AnyConnect client continues to try to reconnect as long as this timer does not expire. 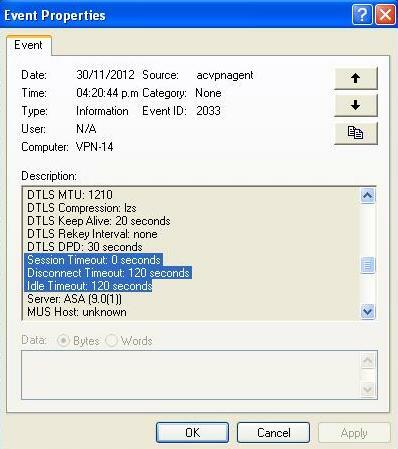 The Disconnect Timeout is set to the lowest setting of either the Group Policy Idle-Timeout or the Maximum Connect Time. Tip: For the ASA to respond to a client that is attempting to reconnect, the Parent-Tunnel session should still exist in the ASA database. In the event of failover, DPDs also need to be enabled for the reconnect behavior to work. The Parent-Tunnel remains the same; this is not renegotiated because this tunnel maintains the session token that is required for the session in order to reconnect. New SSL and DTLS sessions are generated, and different source ports are used in the reconnect. All the Idle-Timeout values are restored. The Inactivity Timeout is restored. Caution: Be aware of Cisco bug ID CSCtg33110. The VPN session database does not update the Public IP address in the ASA session database when AnyConnect reconnects. Note: This enhancement request has been filed in order to make this more granular: Cisco bug ID CSCsl52873 - ASA does not have a configurable disconnected timeout for AnyConnect. There is a roaming feature that allows AnyConnect to reconnect after a PC sleep. The client continues to try until the idle or session timeouts expire and the client does not immediately tear down the tunnel when the system goes into hibernate/standby. For customers who do not want this feature, set the session timeout to a low value in order to prevent sleep/resume reconnects. Note: After the fix of Cisco bug ID CSCso17627 (Version 2.3(111)+), a control knob was introduced in order to disable this reconnect on resume feature. With this change, AnyConnect will try to reconnect when the computer is brought back from sleep. The AutoReconnectBehavior preference defaults to DisconnectOnSuspend. This behavior is different from that of AnyConnect Client Release 2.2. For reconnect after resume, the network administrator must either set ReconnectAfterResume in the profile or make the AutoReconnect and AutoReconnectBehavior preferences user controllable in the profile to allow users to set it. A. It has to miss three retries/four packets. A. Yes, IKEv2 has a fixed number of retries - six retries/seven packets. A. In addition to being a mapping on the ASA, the parent tunnel is used in order to push AnyConnect image upgrades from the ASA to the client, because the client is not actively connected during the upgrade process. A. You can filter inactive sessions with the show vpn-sessiondb anyconnect filter inactive command. However, there is no command to log off just inactive sessions. Instead, you need to log off specific sessions or log off all sessions per user (index - name), protocol, or tunnel-group. An enhancement request, Cisco bug ID CSCuh55707, has been filed in order to add the option to log off just the inactive sessions. A. The "Idle TO Left" timer of the AnyConnect-Parent session is reset after either the SSL-Tunnel or DTLS-Tunnel is torn down. This allows the "idle-timeout" to act as a "disconnected" timeout. This effectively becomes the allowable time for the client to reconnect. If the client does not reconnect within the timer, then the Parent-Tunnel will be terminated. A. The head-end has no knowledge of the client's state. In this case, the ASA waits for the client to hopefully reconnect until the session times out upon the idle timer. DPD does not kill an AnyConnect session; it merely kills the tunnel (within that session) so that the client can reestablish the tunnel. If the client does not reestablish a tunnel, the session remains until the idle timer expires. If the concern is about sessions being used up, set simultaneous-logins to a low value such as one. With this setting, users who have a session in the session database have their prior session deleted when they log in again. A. Initially, when the session is established, the three tunnels (Parent, SSL, and DTLS) are replicated to the Standby Unit; once the ASA fails over, the DTLS and the TLS sessions are reestablished as they are not synced to the standby unit, but any data flows through the tunnels should work without disruption after the AnyConnect session is reestablished. SSL/DTLS sessions are not stateful, so the SSL state and sequence number are not maintained and can be quite taxing. Thus, those sessions need to be reestablished from scratch, which is done with the Parent session and the session token. Tip: In the event of a failover event, SSL VPN client sessions are not carried over to the standby device if keepalives are disabled. Idle timeout - The idle timeout is for when no data is passed over a connection. Disconnected timeout - The disconnected timeout is for when you give up the VPN session because the connection has been lost and cannot be re-established. The disconnected timeout was never implemented on the ASA. Instead, the ASA sends the idle timeout value for both the idle and disconnected timeouts to the client. The client does not use the idle timeout, because the ASA handles the idle timeout. The client uses the disconnected timeout value, which is the same as the idle timeout value, in order to know when to give up reconnect attempts since the ASA will have dropped the session. While not actively connected to the client, the ASA will timeout the session via the idle timeout. The primary reason to not implement the disconnected timeout on the ASA was to avoid the addition of another timer for every VPN session and the increase in overhead on the ASA (although the same timer could be used in both instances, just with different timeout values, since the two cases are mutually exclusive). The only value added with the disconnected timeout is to allow an administrator to specify a different timeout for when the client is not actively connected versus idle. As noted earlier, Cisco bug ID CSCsl52873 has been filed for this. A. By default, AnyConnect does attempt to re-establish a VPN connection when you lose connectivity. It does not attempt to re-establish a VPN connection after a system resume by default. Refer to AnyConnect Client Behavior in Case of System Suspend for details. A. A tunnel-level reconnect will not do either. This is a reconnect on just SSL or DTLS. These go about 30 seconds before they give up. If DTLS fails, it is just dropped. If SSL fails, it causes a session-level reconnect. A session-level reconnect will completely redo the routing. If the client address assigned on the reconnect, or any other configuration parameters that impact the Virtual Adapter (VA), have not changed, then the VA is not disabled. While it is unlikely to have any change in the configuration parameters received from the ASA, it is possible that a change in the physical interface used for the VPN connection (for example, if you undock and go from wired to WiFi) could result in a different Maximum Transmission Unit (MTU) value for the VPN connection. The MTU value impacts the VA, and a change to it causes the VA to be disabled and then re-enabled. A. AnyConnect does not provide any extra "magic" to accommodate session persistence for applications. But VPN connectivity is restored automatically shortly after network connectivity to the secure gateway resumes, provided the idle and session timeouts configured on the ASA have not expired. And unlike the IPsec client, the automatic reconnect results in the same client IP address. 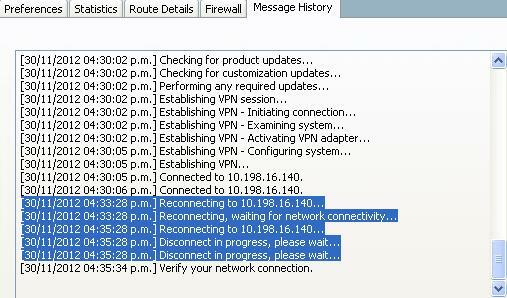 While AnyConnect attempts to reconnect, the AnyConnect Virtual Adapter remains enabled and in the connected state, so the client IP address remains present and enabled on the client PC the entire time, which gives client IP address persistence. The client PC applications, however, will likely still perceive the loss of connectivity to their servers on the enterprise network should it take too long for VPN connectivity to be restored. The AutoReconnectBehavior profile/preference setting cannot be supported on Linux without suspend/resume support, so a reconnect will always occur after suspend/resume. On Microsoft Windows and Macintosh, the reconnects are immediately performed at the session level after resume, which allows for a quicker switch to a different physical interface. On Linux, because AnyConnect is completely unaware of the suspend/resume, the reconnects will take place at the tunnel-level first (SSL and DTLS) and this might mean the reconnects take slightly longer. But the reconnects will still occur on Linux. A. AnyConnect is not tied to a particular physical interface for the life of the VPN connection. If the physical interface used for the VPN connection is lost or if reconnect attempts over it exceed a certain failure threshold, then AnyConnect will no longer use that interface and attempt to reach the secure gateway with whatever interfaces are available until the idle or session timers expire. Note that a change in physical interface could result in a different MTU value for the VA, which will cause the VA to have to be disabled and re-enabled, but still with the same client IP address. A. In a resume, you resubmit the authenticated token that will remain for the lifetime of the session, and the session is then re-established. A. This is only performed in the initial connection. A. No, these run on the initial connection only. Something like this would be slated for the future Periodic Posture Assessment feature. A: Yes, this is correct since you do not re-resolve the hostname via DNS for re-estblishment of an existing session.